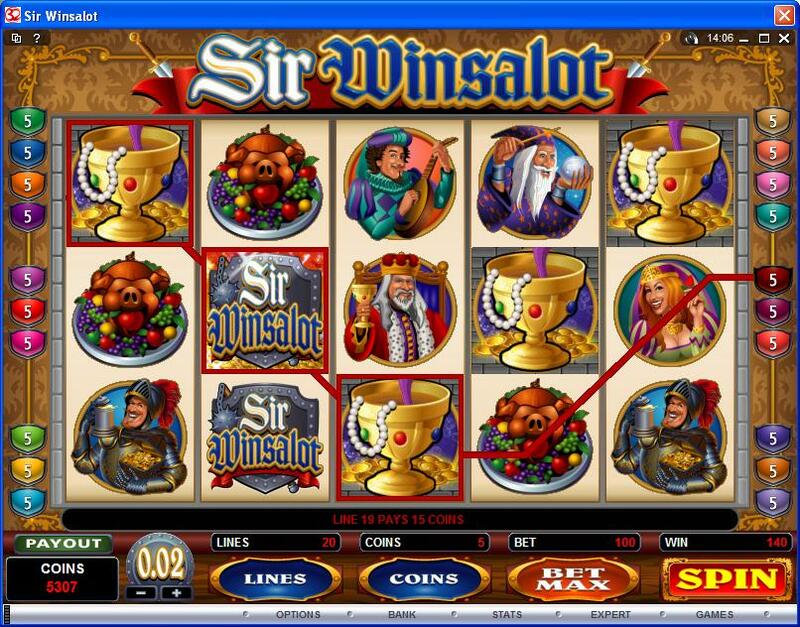 Sir Winsalot is a Microgaming slot machine with a Medieval theme, where a knight is the hero and he does seem to win a lot of money, just like the title says. He is shown with a chest with gold coins in one hand, a beer tankard in the other. The Medieval theme was very well handled, so there is every chance that you will enjoy playing this game. There are a few similar games available out there, with graphics as good as this one, but you will still want to give it a chance. Sir Winsalot has 5 reels and on them you will get a maximum of 20 bet lines. 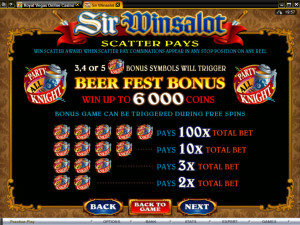 Top payouts will stop at $1,250, but you will find among the features a beer themed bonus game, free spins, scatters and wilds. 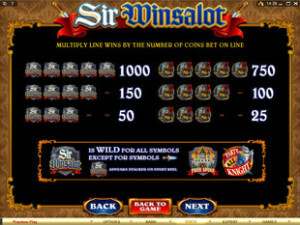 As features, Sir Winsalot comes with wild symbols, with scatters, bonus games, free spins and multipliers. They’re all typical for such slots, but it’s always great to see titles that offer them all in one place. 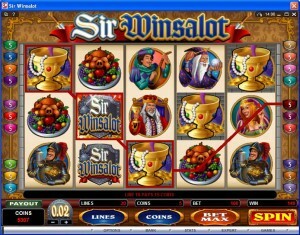 With the Sir Winsalot Logo appearing on the reels from time to time, you will notice that it’s a symbol which tries to improve your chances of getting paid. As long as this symbol appears on the right spot on the payline, with the rest of the positions being occupied by matching regular icons, it will take the same role as the others and the combo will form. The symbols with scatter or bonus features can’t be replaced with a wild. Wilds also manage to award their own prizes, provided that they managed to appear multiple times on the same line. Up to 1,000x can be won with their help. 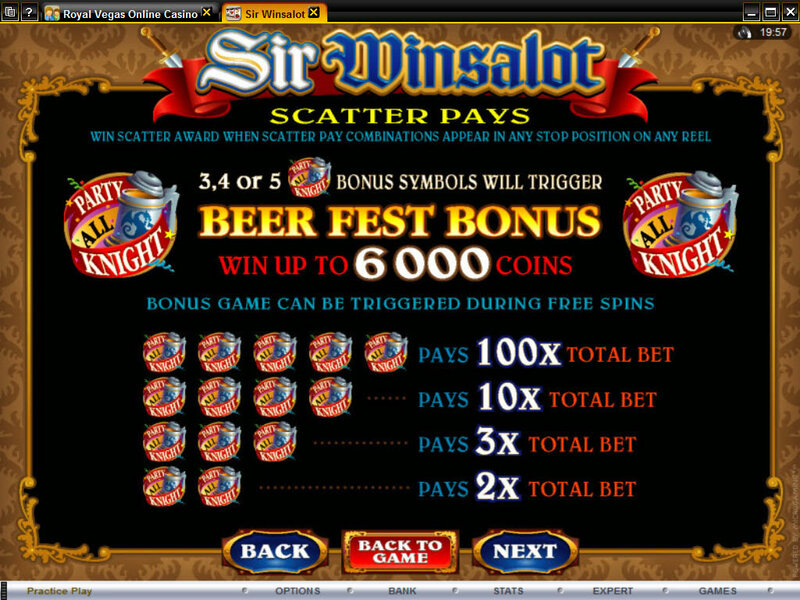 Two scatter symbols are in the game, one triggering the bonus game, the other starting up the free spins. They both award prizes, as high as 100 times the value of the bet. Since these are scatter symbols, the game only looks at how many there are, without taking their position into consideration. 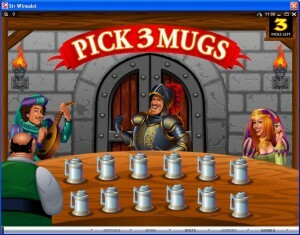 This bonus game has the Beer Tankard as its triggering symbol and it needs it to appear in three to five positions during the same spin. The Beer Fest Bonus will start next, where you can get a top prize of 6,000 coins. 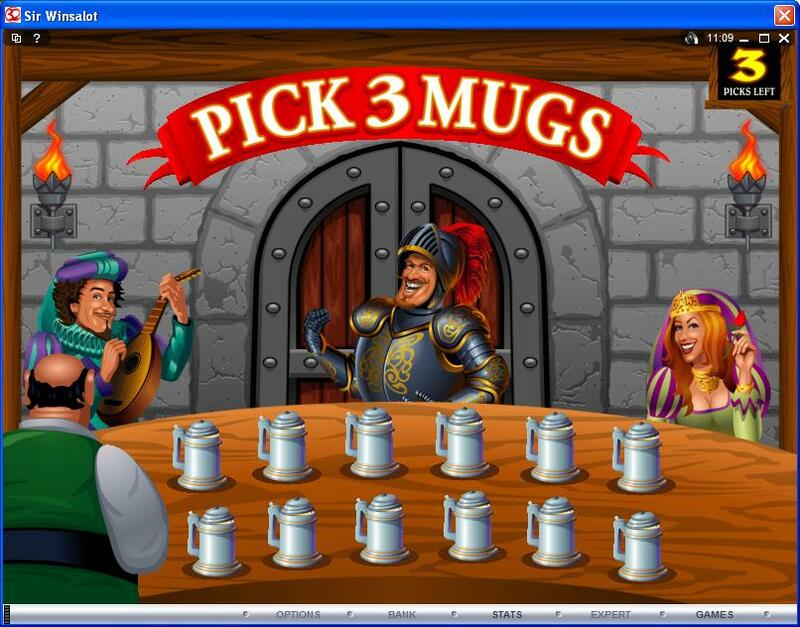 You are taken to a new screen, where 12 mugs of beer are on a table. You are asked to choose 3 of those mugs, each one offering you a random prize. The other scatter symbol has the Castle image on it. It also triggers its feature whenever a minimum of three are on the reels, during the same round. The reward will consist in 7 to 9 free spins, with 3x multipliers making sure that you win a lot more than you would in the base game. You’re not getting asked for a lot of money when you play this game. You decide how many of the 20 lines should be used, plus you choose the coin’s denomination ($0.01 to $0.25) and how many of them should be on a line (1 to 5). You can wager $1.25 per line and up to $25 total, which should be quite affordable for a lot of players. Since the game will put 1,000 times the line bet in your pocket for a combo of five wilds, that means up to 5,000 coins, or $1,250 cash. One of the things I enjoyed most about this game is the design. With the entire line-up of symbols being made up of themed images, Sir Winsalot does well in the rest of the design as well. A tapestry that looks good enough to belong in a king’s palace is used all around the reels. The color used for the reels is white in the base game and turns to black during the free spins. Since the game talks about a party which takes place in the castle, the symbols are with singers and entertainers, attendants and lots of food and gold. 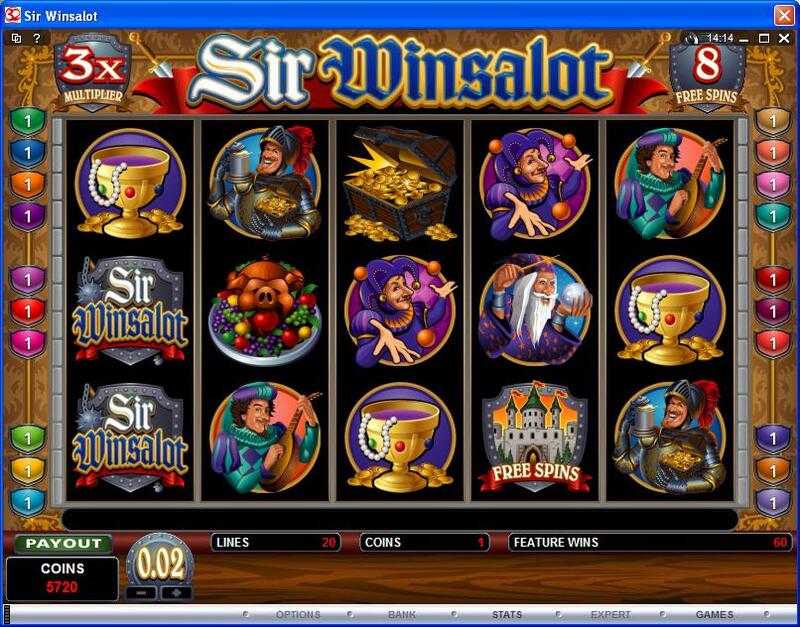 Symbols: Party All Knight Tankard (bonus, 100x the bet), Castle (scatter), Sir Winsalot Logo (wild, 1,000x), Sir Winsalot (750x), Treasure Chest (500x), King (350x), Princess (250x), Wizard (150x), Bard (75x), Jester (60x), Cooked Pig (45x) and Gold Goblet (25x). 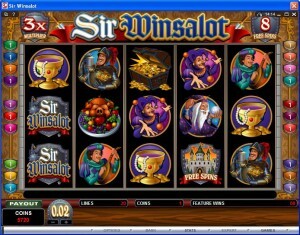 Give Sir Winsalot a try, it’s got the right design and all the features you could expect from a modern slot machine. It should be a very good title to spend some time with. 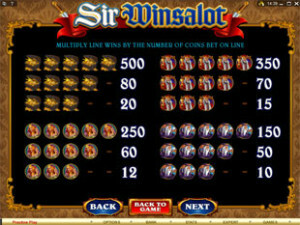 The Sir Winsalot slot machine is offered through the Microgaming platform, so if you want to play it for real or just to practice, look out for casinos that use it.